The ?HC540 and CD74HCT540 are Inverting Octal Buffers and Line Drivers with Three-State Outputs and the capability to drive 15 LSTTL loads. The ?HC541 and ?HCT541 are Non-Inverting Octal Buffers and Line Drivers with Three-State Outputs that CAN drive 15 LSTTL loads. The Output Enables (OE1) and (OE2) control the Three-State Outputs. If either OE1 or OE2 is HIGH the outputs will be in the high impedance state. For data output OE1 and OE2 both must be LOW. This is one package pinout of CD74HCT540,If you need more pinouts please download CD74HCT540's pdf datasheet. 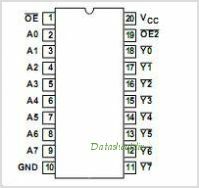 CD74HCT540 circuits will be updated soon..., now you can download the pdf datasheet to check the circuits!